Shrimp aquaculture in tropical regions is facing a disease-induced catastrophe of lost production. It is estimated that more than 40% of tropical shrimp production is lost to disease annually. The devastating impacts of disease on lost incomes, livelihoods, increased operational costs, trade restrictions and loss of consumer confidence has been a subject of many consultations and policy dialogues. Discussions of disease crisis have to date been largely focused on identification of pathogens, guidelines and standards for disease detection and surveillance, regulations to limit trans-boundary movement of animals, and adoption of better management practices. 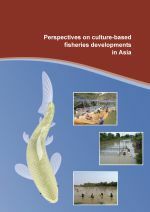 Broodstock management as it is currently conducted in SE Asia, particularly by secondary and small-scale hatcheries, is likely to cause rapid accumulation of inbreeding and loss of genetic diversity ("genetic erosion") at farm level. Inbreeding increases susceptibility to diseases and lowers the threshold for the outbreak of epidemics. This effect may be especially strong in shrimps. Separately from its correlation with inbreeding, declining genetic diversity also increases the incidence of epizootics (the monoculture effect) and impedes the ability to adapt to stressful environments and changing climate. These epidemiological effects of climate stress and inbreeding are likely to be multiplicative. The possible role of genetic erosion in the incidence and prevalence of diseases and epizootics are not included in current discussions of the disease problem in tropical aquaculture. The basic tenet for this consultation is that an important aggravating factor in the disease crisis is an agro-economic system that locks shrimp breeders, hatcheries and farmers into behaviour that induces high levels of inbreeding. If inbreeding does increase the severity and frequency of epidemics, this disease crisis will only get worse over vast areas of Asia, Central and South America, Africa and the Middle East until it is addressed. This expert consultation was organized in conjunction with the annual meeting of the NACA Aquatic Animal Health Advisory Group to take advantage of the physical presence and expertise of a small group of world renowned Aquatic Animal Health experts from several national and international institutions. The list of participants and workshop agenda are presented in Annexes 1 and 2. 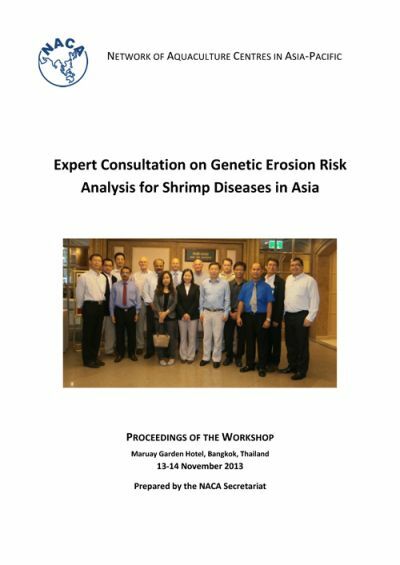 This consultation is perhaps the first of its kind to bring together a balanced group of experts from diverse fields – epidemiology, microbiology, disease diagnostics & surveillance, aquaculture genetics, fish breeding, and evolutionary biology – to take a fresh, in-depth, and wider perspective on the possible interaction between genetic side-effects of broodstock management and the looming threat of aquatic animal diseases, in particular the contemporary shrimp disease crisis.